We are based in Albufeira, Portugal which we choose for its fantastic all year round ‘California’ climate, rugged coastline, fascinating culture and wonderful food. Learn2Sail Platinum is a sister company of Learn2Sail in which we specialise in year round training of the RYA training courses, from Competent Crew to Yachtmaster. Our location - the Portuguese Algarve! A marvellous climate with typically sunshine all year round. 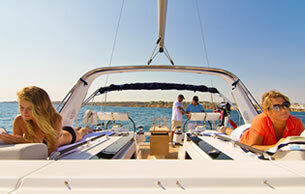 The ability to sail all year round in perfect weather. Tidal waters of the Atlantic, keeping you cool in the summer. Personal professional service at all times. The people you talk to are the ones taking you sailing. Easy access with Faro international airport just 35 minutes away. Stunning coastline and scenery with local marinas at Lagos, Portimao, Albufeira, Vilamoura and amazing anchorages at Faro/Olhao, Alvor, Praia de Rocha etc. Also we are midway between Lisbon on the west coast and Gibraltar at the entrance to the Mediterranean, both are approx. 150 miles away. The Spanish border is within easy reach, up the Guadiana River to Ayamonte. Mark & Jane Sanders are the owners of Learn2Sail and we have had our sail training school operating out of the Algarve since 2008. In that time we have trained hundreds of students not just to sail to a syllabus but to be confident and competent in their boat handling and navigation etc. Learn2Sail Platinum offers an exciting option to extend that training on a bigger, more luxurious yacht, the new Beneteau 55, in which you can sample the true meaning of "outdoor living". Contact us today for more information on the "Platinum" experience. This is a huge thanks from me for a terrific week on the lady Osprey. I hope "she liked it" as much as I did.